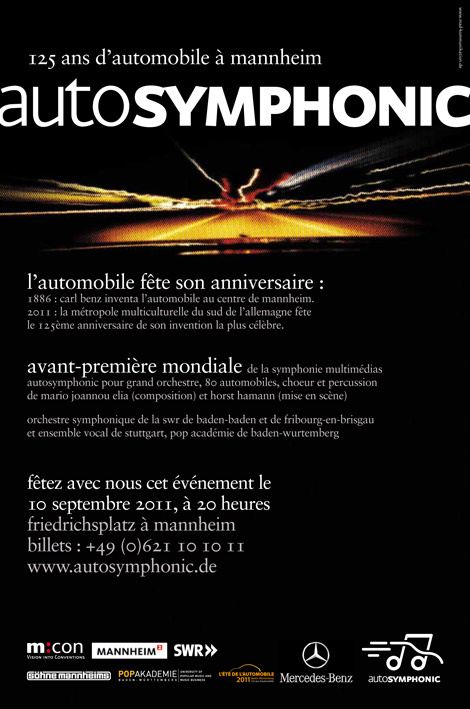 AUTOSYMPHONIC was created as an event to celebrate the 125th anniversary of the invention of the automobile. 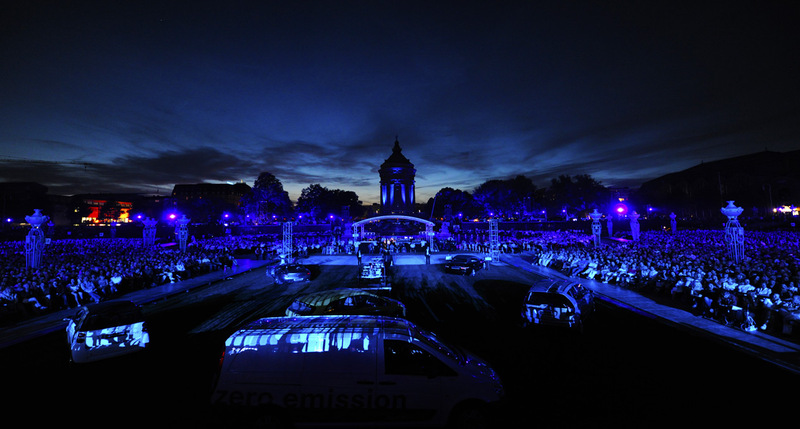 It would be the highlight, culmination and finale to the Baden-Württemberg festival The Summer of the Automobile 2011. The aim was to create a musical work about the invention/genesis of the automobile, which similarly was discovered through research into the area of sound and then retold through such so that the topic itself became the medium: the cars, producing the widest possible range of sounds and tones were converted into instruments. 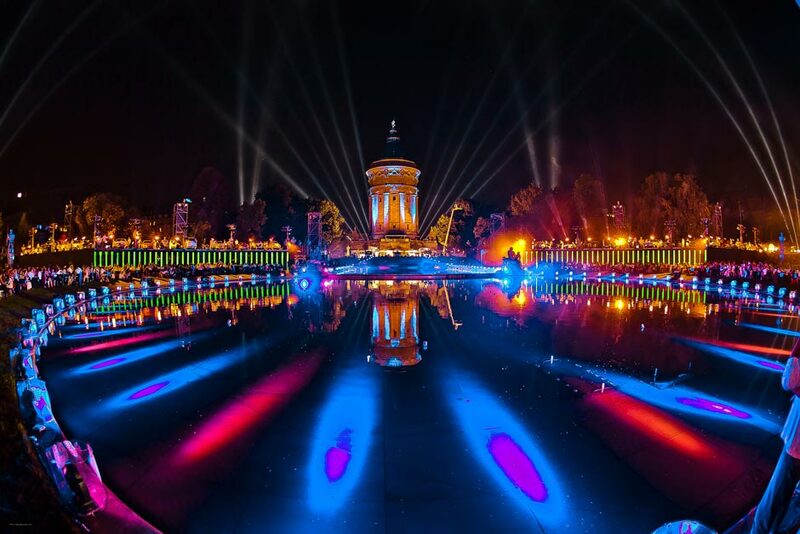 The aim of the concept behind AUTOSYMPHONIC was to unite the so-called high cultural arts with a contemporary event and to have this unfold in an energy filled balancing act. The underlying concept for this event was precisely and holistically planned out. It had to be attuned to the challenging conditions of the location of the site (for example the size and the echo delay times of the performance location, the coordination of the positions of the musicians and the auto parts which had to be placed quite a distance apart from each other, the playing to click-tracks and simultaneously being able to see and follow the directions of the main conductor via monitors). And as was the case with AUTOSYMPHONIC the term, or should I say the definition of the word Event, could no longer be explained with its usual connotations but rather became a diversified, distinctive genre with its own original aesthetical artistic characteristics. 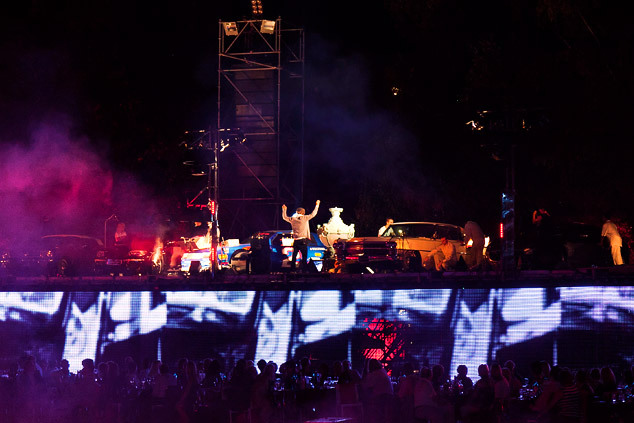 The goal of AUTOSYMPHONIC was to present a culturally formatted event in an innovative and contemporary style which should encompass and integrate well-known everyday objects – in this case the car – into a brand new context. 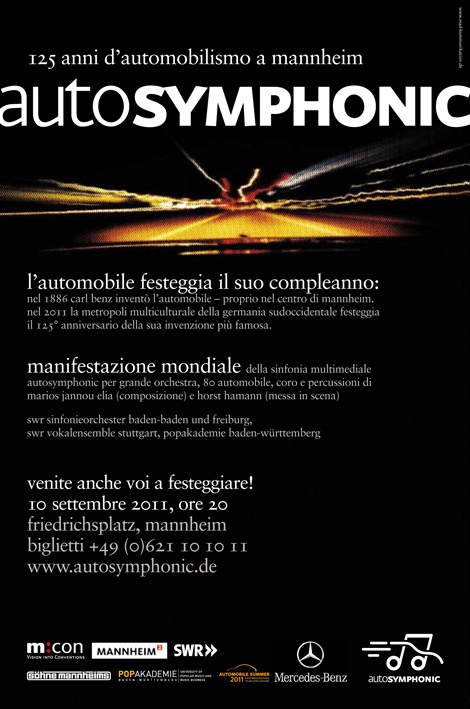 AUTOSYMPHONIC is an open air, multimedia symphony written for a symphony orchestra, 80 automobiles, 120 percussionists, choir, youth choir, pop band vocal ensembles, percussion octet and live electronics. 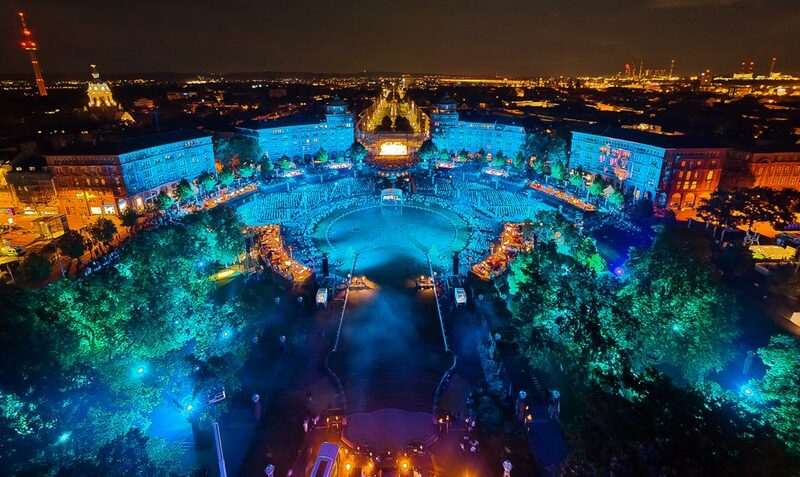 The world premiere took place on the Friedrichsplatz in Mannheim, simultaneously on 14 stages on a total area of 65,000 sqm and before an audience of 20,000 people. 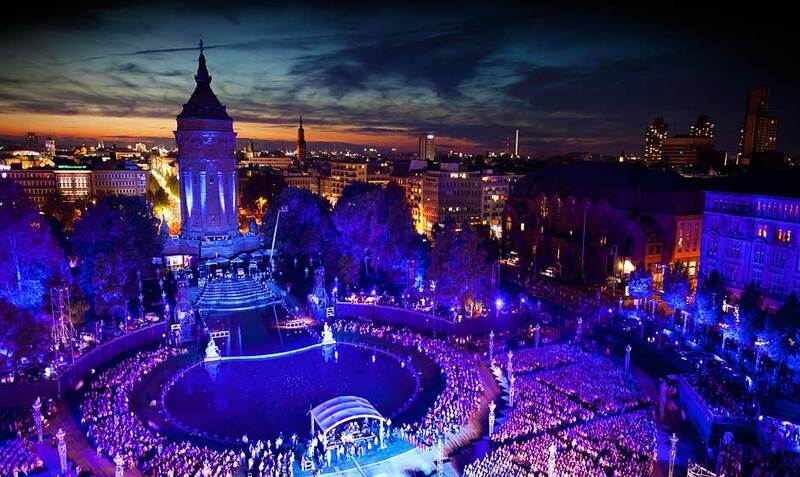 290 musicians and more than 100 technicians took part in the performance. 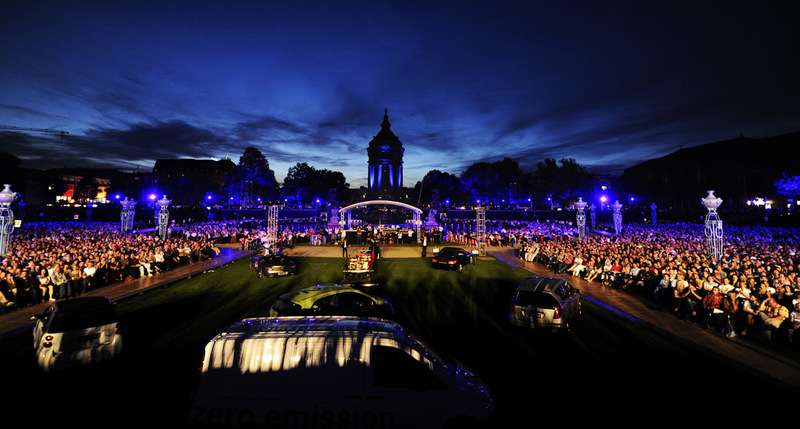 In addition to the SWR Symphony Orchestra Baden-Baden and Freiburg, the SWR Vocal Ensemble Stuttgart, the children’s choir from the Stuttgart State Opera, the Pop Academy Baden-Württemberg and vocalists of the Söhne Mannheims 120 young people from Mannheim participated: they played the 80 automobiles which were implemented as musical instruments. The autobiography of Carl Benz was the central focus in the composition. Selected quotes are the pivotal points of the nine movements of the symphony. They are constantly sung over and over again by the choir and retell the doubts plaguing the inventor along the way, as well as his hopes of unlocking a new world for humanity through the automobile. The autobiography of Carl Benz also influenced the musical score. For example the sound of a bell moves throughout the piece in different variations, created by differing sources of sound. This element has been derived from an autobiographical passage called The Best New Year’s Eve, in which Carl Benz describes how he finally got the engine going in his workshop, and that at the exact same time when the bells of Mannheim rang out the New Year. Automobile sounds are incorporated into six of the nine movements. 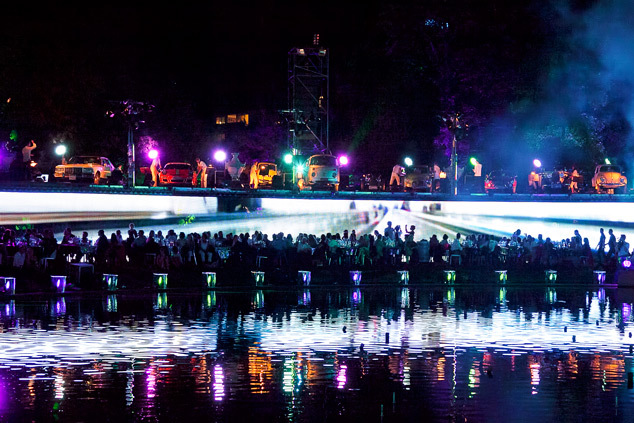 In each movement one group of the 80 vehicles is highlighted in a solo performance. Opposite the symphony orchestra and the choir, the automobile orchestra was set up on its own covered pergolas spread out around the Friedrichsplatz. Amongst the car ‘instruments’ were very rare and special models from the history of the automobile: for example the first patented motor car model from 1886, a Mercedes Benz SLS, a Ferrari 599 GTB Fiorano, an Audi R8 Spyder, a Porsche 356 A, a Rolls-Royce Silver Cloud III and a Lanz-Bulldog Ackerluft. 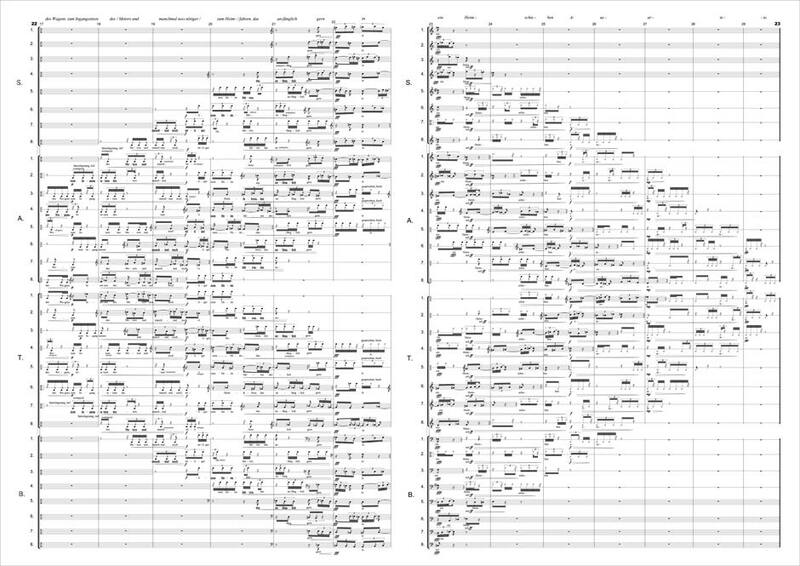 In total, around 800 different car sounds and tones were integrated into the piece. These were placed in correspondence to the symphony instruments, among them such sounds as made on wind machines, water drums and water phones, oil drums, wheel rims, and tuned stone and metal plates. The music was composed in 4/4 time, a facsimile to the four-stroke engine. Twelve stages (marked with yellow) all around the Friedrichsplatz (score excerpt). Benz created a new world with the invention of the automobile. “Out of the small and narrow to the great light beyond”, sings the choir. In the background wind machines create the sound of a wheel – the future era when individuals will move as they wish. And similar to a genesis, more and more elements join in to the music: the wheels, the horns, the doors, the trunk, the windscreen wipers and for the first time, the engine. The car has been born and with it a new sound. Now the interaction begins; full of rhythm the voices are treated like parts of a machine. Man dominates the machine. The tones complement and melt into one another while the choir sings Benz eulogies to the rhythm of the engine. This poetical transition is performed by the singers and rappers of a modern pop music band together with the choir, orchestra and percussionists. On the one hand it refers to the dream of Carl Benz to create an automobile and on the other hand this dream heralds the coming of a future of mobility. Whether sports car or truck – form must follow function. This is depicted musically by a car quartet, four vehicles each one representing a different epoch and possessing an extraordinary potential for creating sounds. The cars begin a mechanically rhythmic and passionate dialogue: the machine is alive. … what the car offers man. It bestows power, offers independence and touches the emotions. Car sounds that have to do with opening something fill this act: the fuel tank cover, the container for the windshield wiper fluid or the electric door of the bus. The climax is a tenor solo which reminds us of Carl Benz. In the finale the prima donna joins in and represents the presence of Bertha. The childlike perspective of the car is reflected in the children’s choir, which sings a poem by Erich Kästner. The purpose is to make a connection to the Benz family: the sons once convinced their mother Bertha that the car was suitable for overland travel and encouraged her in 1888 to set out on her legendary journey to Pforzheim. VIRTUAL REALITY deals with Benz’s brave belief in technology and the future. 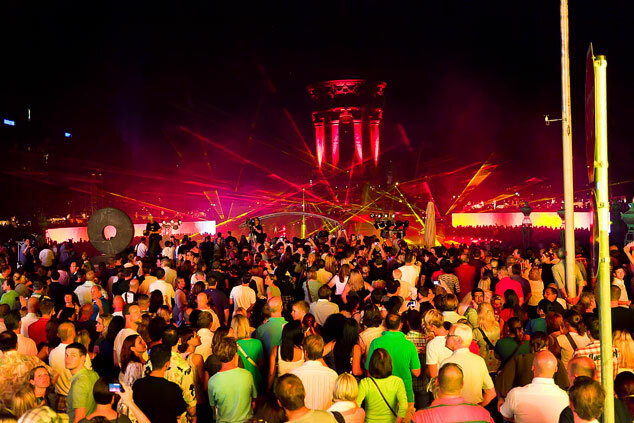 This act is filled with electronic, futuristic sounds and tones. The sounds of the engines are the focal point in one last short loud surge – before the era of the classical combustion engine comes to an end and new technology replaces it. Thus AUTOSYMPHONIC is a kind of requiem for the standard power transmission engine. All of the voices, instruments and automobile sounds join together to sound out a hymn to the automobile. The music rises up steadily and the story of the automobile peaks in the dawn of a new era in time: the time to invent the automobile anew. “The whole is nothing more than the sum of all its parts”. Aristotle differentiates between the sum – where the parts are simply counted up together – and the whole – where the parts are integrated into each other. In reference to AUTOSYMPHONIC there are two aesthetic qualities. The first one, the internal quality, refers to the composition, which represents a complex interweaving of the relationships between the heterogeneous components. Additionally, the composition possesses concrete guidelines, for example the script or score and a pre-produced simulation of sounds, which constitutes the way in which the piece can be distinguished from others, thus setting the framework means by which the performance may be repeated at some future time. The visualization/staging and the performance situation, however, remains variable. On this level we find the second quality, the external one. 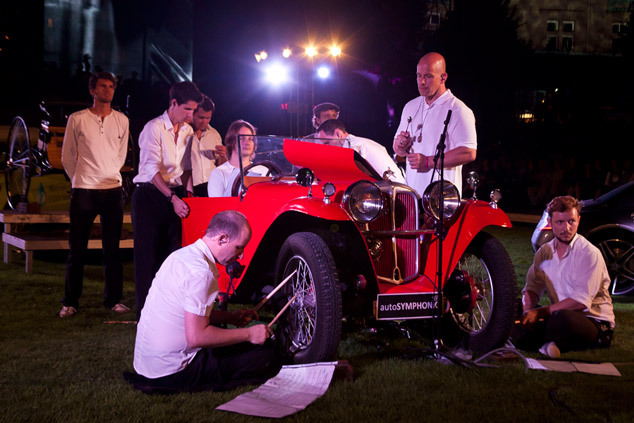 The automobile took on a new aesthetic quality by being used as a part of a musi- cal ensemble, something that has awakened great public interest. 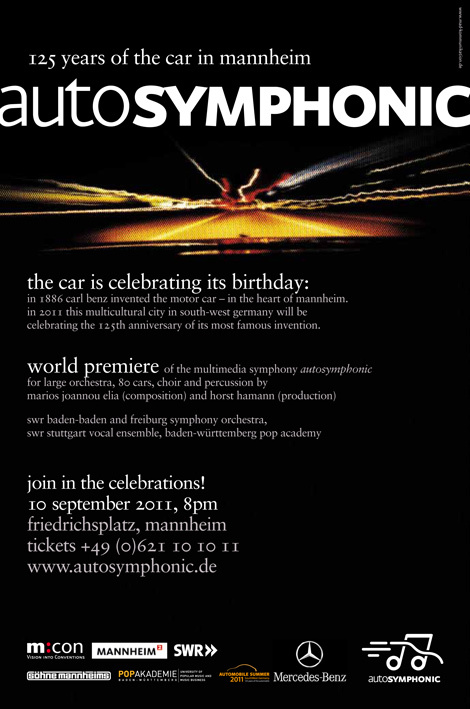 The automobile orchestra officiates as a medium to link a wide scale audience and contemporary music. According to official statistics AUTOSYMPHONIC reached a press radius of somewhere in the billions. Moreover, the participants for the car casting were actively involved in the development process and this one-year experience workshop attended by the young people involved in the project is now being used in practice as an initiative to promote (poly)aesthetic education. Polyaesthetics arose out of the polymedial usage of materials which is systematically intended and constructive for the development of the artistic process. The hybrid is a central aspect of the concept of polymediality (hybridism is fundamentally not to be seen as genre comprehensive; it refers to original applications which com- prise a wide range of hybridization processes). 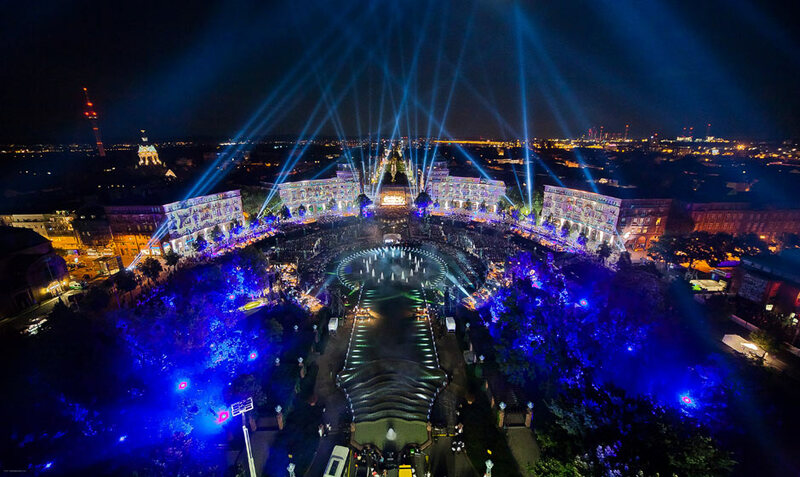 Strangely enough, in movement IV The Dream, AUTOSYMPHONIC embeds a Pop music band vocal ensemble into the performance: together with the symphony orchestra and the choir there is a soul artist as soloist as well as three pop music singers and two rappers. Without losing its autonomy, the pieces try out combinations and set out on musical expeditions which present a productive balance between the well-known and the unknown: in this case between the classical and pop music elements or between the unconventional instruments and the traditional sound producers. 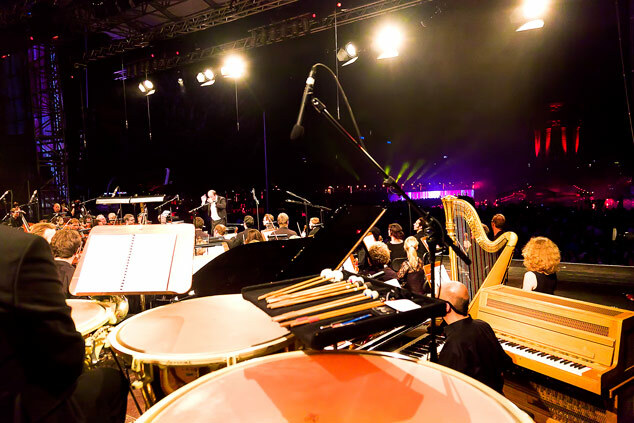 In this way the genre symphony strays from its original form and changes in style and technical treatment of the music. The Dream, the name of the first Bridge in the symphony, just like the second, Overland by Car for the children’s choir, I composed as a type of window, as a deviation within the symphony comparable to Mozart’s arias that resembles a prosaic inci- dent, similar to the aria of Susanna in the second act of Le nozze di Figaro (Venite, inginocchiatevi). 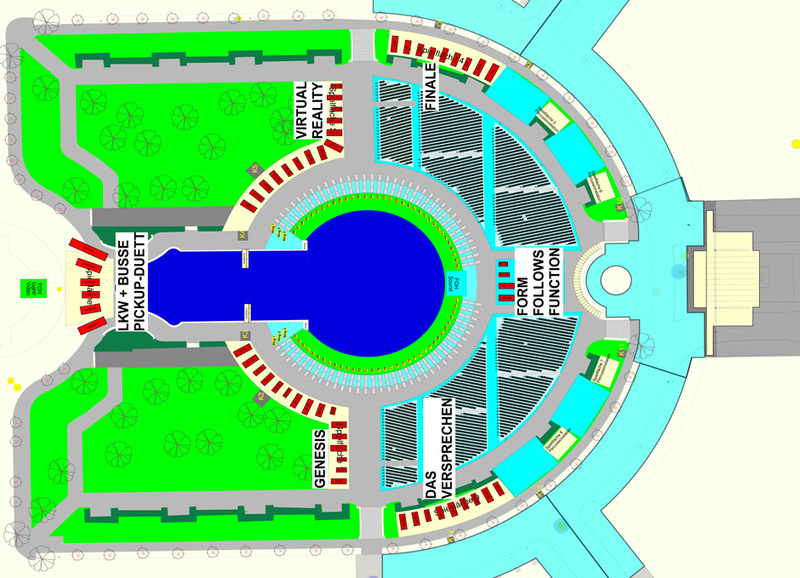 Any further performance of AUTOSYMPHONIC (there was for example a request to perform in Moscow on Red Square) will still remain a world premiere in its entirety due to the actual performance site and the distribution of sounds throughout that space, to the reworking or the insertion of a completely new pop music band vocal ensemble, which usually would include a group from the county or region being performed in, etc. 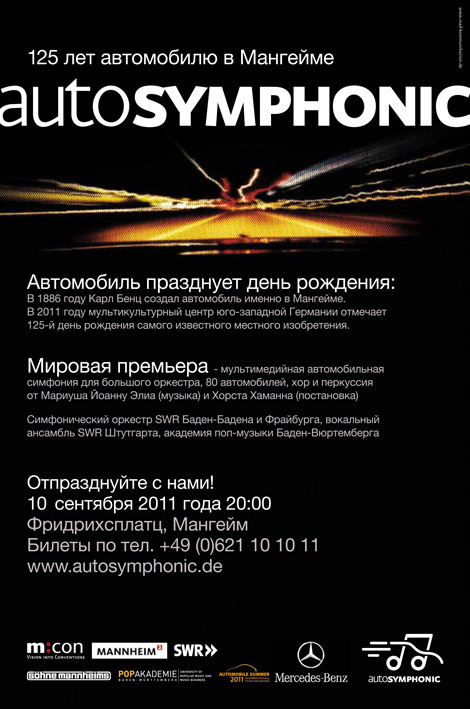 Furthermore, the actual automobile orchestra would have to put together anew for each performance. In spite of the highly detailed musical score and the meticulous instructions for staging, the entire production AUTOSYMPHONIC conceals within itself a never-ending potential for creating something totally new depending on the situation and location. We can say that the possibilities for regeneration are wide open. 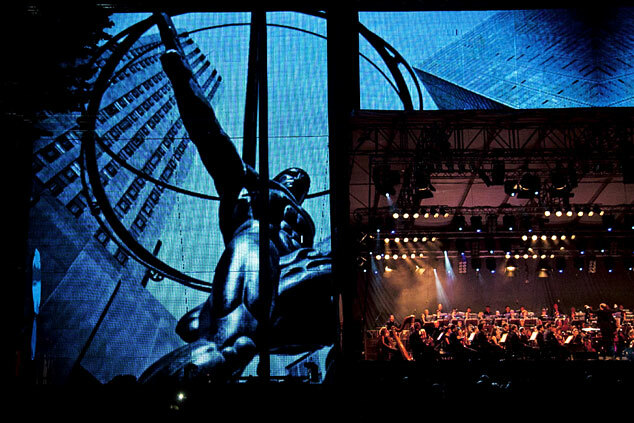 If we take this point into consideration the ever-changing possibilities for a presentation of the composition should be stated as the aesthetic implementation which provides this work, with additional distinguishing qualities of flexibility and adaptation, for performances in both concert halls and opera houses. 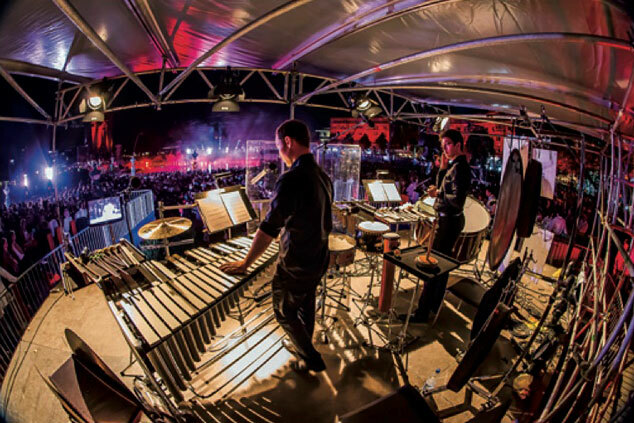 Instrumentation: for symphony orchestra, car orchestra (80 vehicles) and 120 car-players (120 percussionists), choir, children’s/youth choir, pop band vocal ensemble, percussion octet, electronics and 360° spatial sound reinforcement system. Text: “Die Erfindung des Automobils. Erinnerungen eines Achtzigjährigen” (The Invention of the Automobile: Memories of an Octogenarian) by Carl Benz (in German). 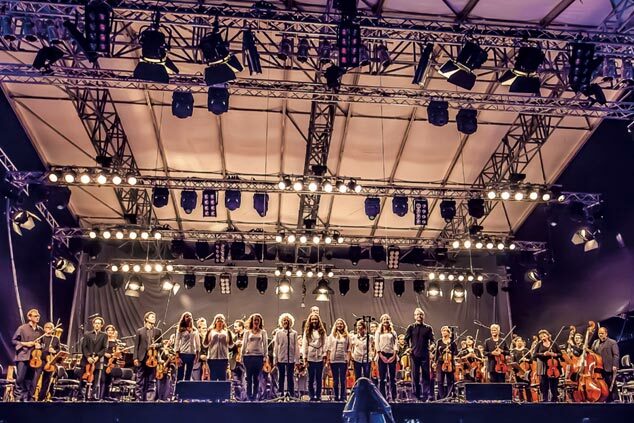 SWR Baden-Baden and Freiburg Symphony Orchestra, SWR Vocal Ensemble Stuttgart, Stuttgart State Opera Children’s Chorus, Percussion Octet of SWR Symphony Orchestra, Söhne Mannheims, Pop Academy Baden-Württemberg, 120 adolescents from the City of Mannheim. Conductor: Johannes Harneit, Conductor Vocal Ensemble: Klaas Stok, Conductor Children’s Chorus: Johannes Knecht, Electronic sound production and studio direction: Nick Elia, Car casting recordings: Stephan Diebel, Spatial sound reinforcement system: Pool Group Frankfurt, Schoko Pro Wiesbaden, Projektwerk Darmstadt. 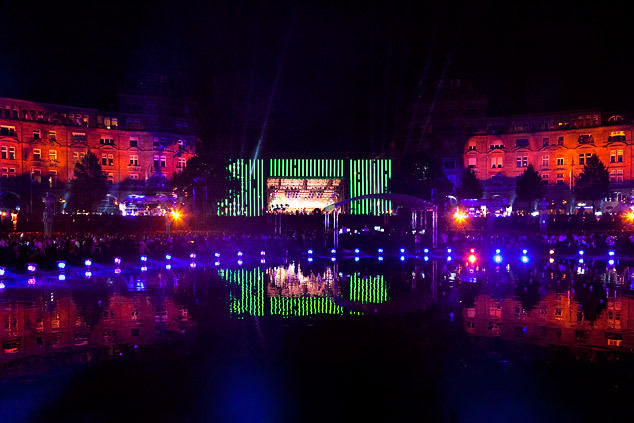 Multimedia visualisation: Horst Hamann, Tarm Bochum, Looplight Marburg, Showfootage Marburg, Medienallianz Ludwigshafen, Gerdon Lights and Scenic Design. 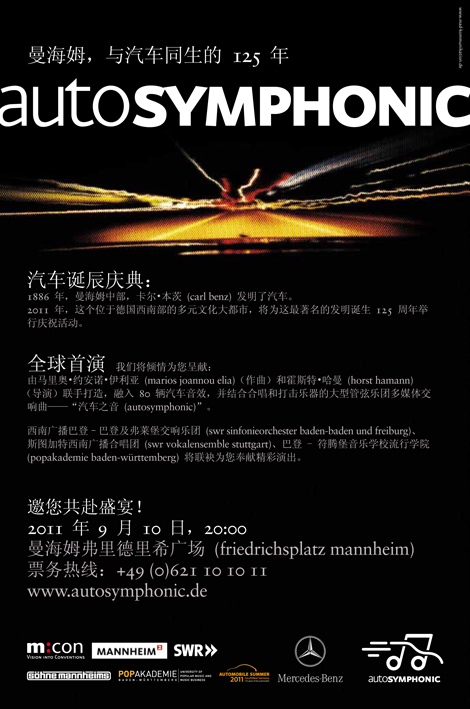 Since the beginning of 2011, autosymphonic gained international media interest resulting in attracting journalists from India to Beijing, to visit Mannheim’s Friedrichsplatz (the work’s performance site) or take part at the car ‘castings’. 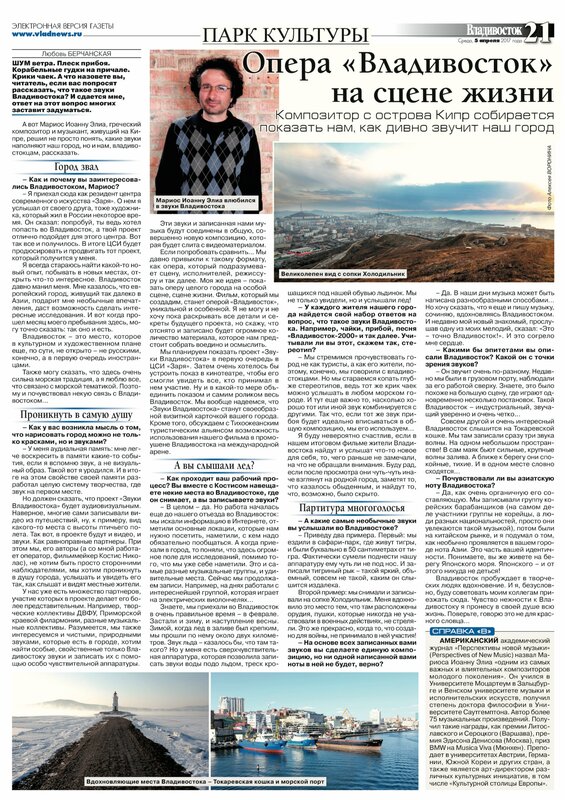 At the same time, presentations of the project were held in the USA, UK, China, Russia, etc. 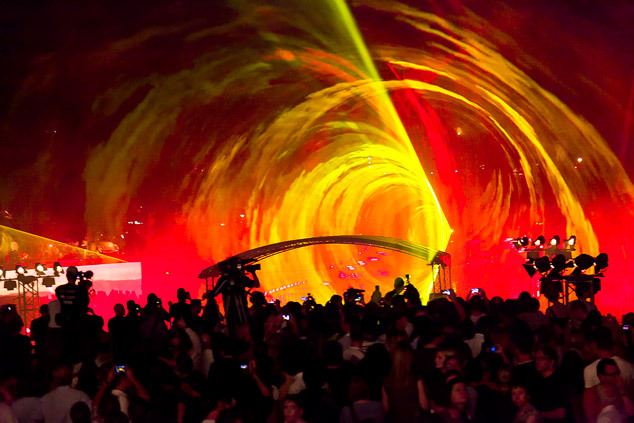 The German Convention Bureau together with the German National Tourist Board promoted autosymphonic worldwide as a leading cultural event destination (read London’s press release). 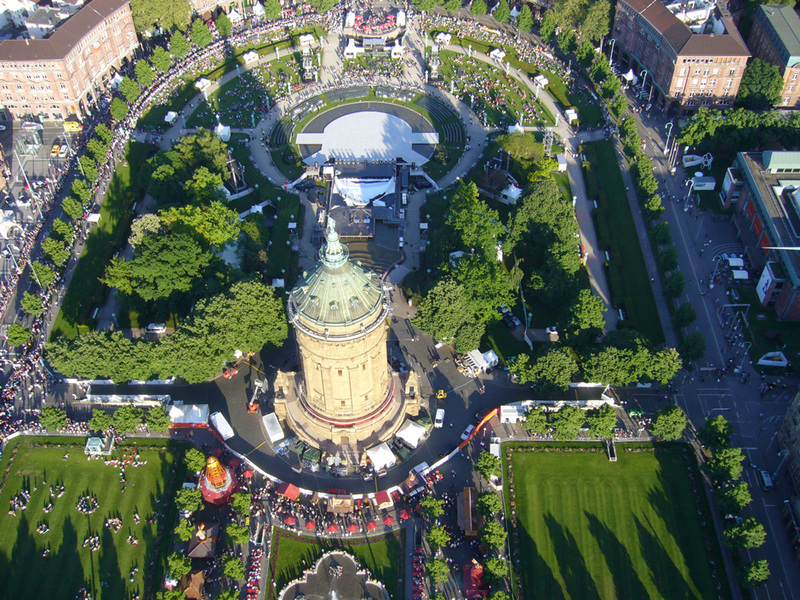 Additionally, newspapers like the Ottawa Citizen included Mannheim and autosymphonic in the world’s top 50 destinations for the year 2011. Als den Klang der neuen Zeit hat Carl Benz in der Neujahrsnacht 1879 die ersten zuverlässigen Lebenszeichen seines endlich ohne Stottern tuckernden Motors bezeichnet. Auto, Motoren, Technik: das war Musik in den Ohren des Technikfreaks und Erfinders. Keine Frage, er wäre mit den 20000 Mannheimern und Mannheimerinnen begeistert gewesen. Zum 125. Geburtstag des im Jahr 1886 als Reichspatent bestätigten „Benz Patent-Motorwagen“ inszenierte die Stadt Mannheim am Samstag die Welturaufführung der eigens für dieses Jubiläum komponierten „autosymphonic“ des in Europa renommierten zypriotischen Musikneuerers Marios Joannou Elia. 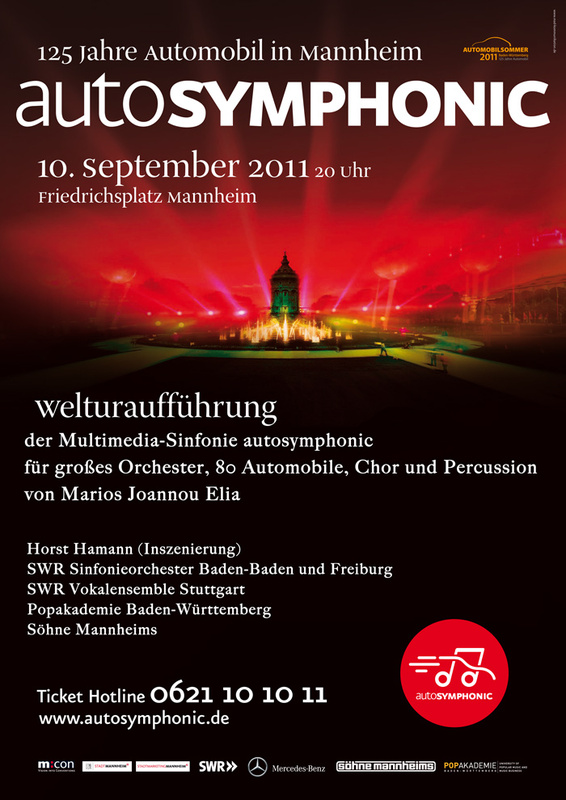 80 Automobile als „Musikinstrumente“, das SWR Sinfonieorchester Baden Baden und Freiburg mit seinem Perkussions-Oktett, das SWR Vokalen- semble Stuttgart, der Kinderchor der Staatsoper Stuttgart, die Popakademie Baden-Württemberg und nicht zuletzt die Popband „Söhne Mannheims“ fanden sich auf dem 65 000 Quadratmeter großen Friedrichsplatz der Stadt zu einem einzigartigen Klangkörper zusammen. Multimedial überformt mit einer Video- und Laserschow des Fotografen und Videokünstlers Horst Hamann wurde aus dem gelungenen Vorhaben in der Open-Air-Arena ein Fest für alle Sinne, als Abschluss und absoluter Höhepunkt des Automobilsommers im Autoland Baden-Württemberg. Die „Söhne Mannheims“ waren nicht nur als Sänger und Rapper in der „autosymphonic“ mit von der Partie. Als originale Mannheimer Popgruppe, heizten sie dem Publikum im Vorprogramm ein. „autosymphonic“, gemanagt von „m:con – Vision into Conventions“, ein einmaliges Groß-Ereignis? Keineswegs. Im Gespräch sind Aufführungen auf dem Roten Platz in Moskau, aber auch in Peking und in Paris. Allerdings, so betont Marios Joannou Elia, werde dann das Konzept auf die kulturellen und örtlichen Gegebenheiten abgestimmt sein. Gigantisch, einzigartig, spektakulär – kein Superlativ schien im Vorfeld gut genug, um zu beschreiben, was sich mit „autosymphonic“, jener Großveranstaltung auf dem Mannheimer Friedrichsplatz zum Abschluss des Autojahres eignen wird. 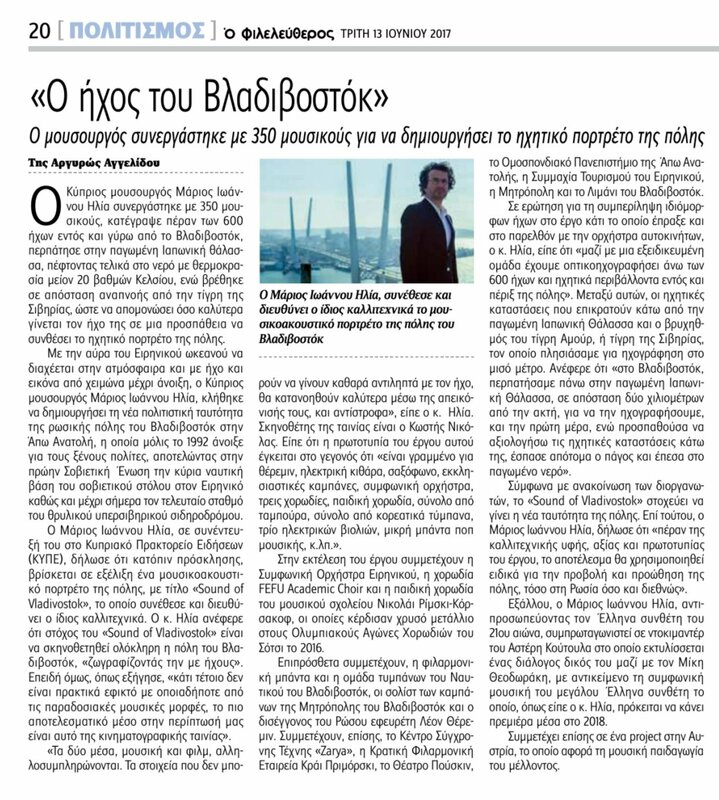 Doch als am Samstagabend nach mehr als zwei Stunden die letzten Töne der Komposition des zypriotischen Komponisten Marios Joannou Elia verklungen waren, war klar: Die Marketingmaschine war zwar perfekt geschmiert (um im Thema zu bleiben). Sie hatte jedoch nicht zu viel versprochen. Geräusche sind nicht erst im 20. Jahrhundert feste Bestandteile klassischer Musik. Auch gehupt wurde schon vor Elia, etwa in Puccinis Operneinakter „Il Tabarro“. Das hier jedoch hat eine andere Dimension. 80 Autos, vom Trabi und der Isetta bis zu Maserati, Porsche oder auch einem kraftstrotzenden LKW, sind kreisförmig um die Mannheimer Jugendstilanlage angeordnet. Ein Maschinenorchester nie gesehener Dimensionen. Sorgfältig ausgewählt in einem Autocasting. Die Nachfolger des vor 125 Jahren von dem Mannheimer Carl Benz erfundenen Automobils reden ihre ganz eigene Sprache. Das Vokabular reicht weit über das schnöde Hupen hinaus. Sie knarren und knarzen, ticken und tacken, wenn Türen geöffnet. Fensterwischer und Blinker betätigt werden. Bedient, gottlob dann doch, vom Menschen. Keine totalemanzipierten Roboter. Eher eine Art bester Freund des Menschen auf vier Rädern. Bis zu vier Jugendliche, ausgebildet, geschult, vorbereitet an der Popakademie, stehen an einem Fahrzeug. Pflichtbewusst geht der Blick auf den Notenständer. Zur auskomponierten Geräuschkulisse gesellt sich – die menschliche Stimme. Kinder vor allem, von der Staatsoper Stuttgart, intonieren das Erich-Kästner-Gedicht „Im Auto über Land“. Unschuldiger Gesang hier, aufheulende Motoren dort. Nicht gegeneinander, sonder miteinander. Wie die Stimmen des SWR-Vokalensembles aus Stuttgart. Und, natürlich, die Söhne Mannheims. Elias Partitur liegt in den Händen von Johannes Harneit am Pult des SWR-Sinfonieorchesters Baden-Baden/Freiburg. Es ist eine gleichermaßen hochkomplexe wie klar strukturierte Partitur. Natürlich im 4/4-Takt. Schließlich ging es Carl Benz um einen Viertakt-Motor. Stark rhythmische Passagen wechseln sich mit großen sinfonischen Ausbrüchen, emphatischen Triumphen ab. Steigerungswellen werden aufeinander getürmt, steuern auf ein grandioses Finale zu. Erzählt wird eine Schöpfungsgeschichte: die Genesis des Automobils. In fünf Akten, Zwischenspielen, Ouvertüre und Finale. Am Anfang steht die Vision des genialen Erfinders Carl Benz. Am Ende: deren Überwindung? Ablösung? Immerhin der Ausblick, zumindest die Hoffnung auf eine nächste Vision: Das Auto der Zukunft, das anders aussehen muss. Es ist ein Weg durch Elemente. Erde, Wasser, Feuer, Luft. Hinzu kommt: Metall. Wir können das sehend hören. Hörend sehen. Der ganze Friedrichsplatz eine riesige Leinwand. Die Häuser, der Wasserturm, alles dient als Projektionsfläche von Bildern, die sich der Mannheimer Fotograf Horst Hamann ausgedacht hat. 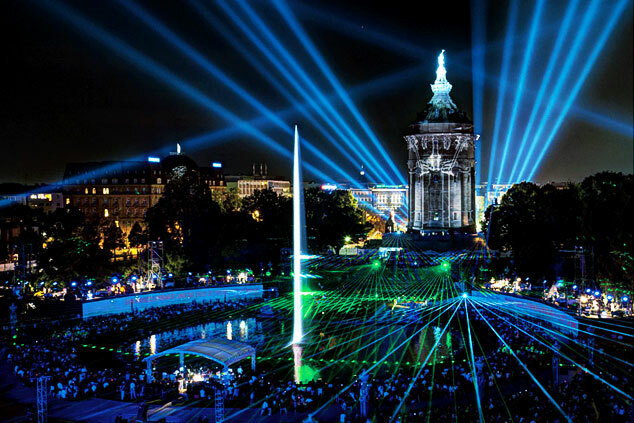 Laserstrahlen bilden Lichtteppiche über den Köpfen der rund 20.000 Besucher. Im Finale scheint der Wasserturm sich in Bewegung zu setzten – dank modernster 3-D-Techink. Immer wieder zu sehen: das Vincis Mensch. Dazu Ineinandergreifende Zahnräder, Autoströme, vorbeihastende Passanten. Die Komposition wird zum Gesamtkunstwerk. Auch wenn der Wagnersche Begriff inflationär gehandhabt wird, hier hat er seine Berechtigung. Denn Musik und Totalbebilderung sind ja nur zwei von drei Komponenten. Die dritte: der ort. Der Jugendstil-Konzertsaal. Nichts ist gegen die Umgebung inszeniert oder komponiert. Alles fügt sich ein. Bis hinauf zu den Passanten, die in den oberen Etagen der Häuser am Ring die Zahngäste abgeben. Und man nähert sich die Botschaft des Werkes: Technik als Produkt menschlichen Geistes, fügt sich ein eine wenn auch städtische, kultivierte Umwelt. Nicht als Konfrontation, sondern als Harmonisierung. Ein Ausblick ebenso wie ein Auftrag. Auch an jene Kopfe, die in der nachfolge von Carl Benz über das Auto der Zukunft nachdenken müssen. 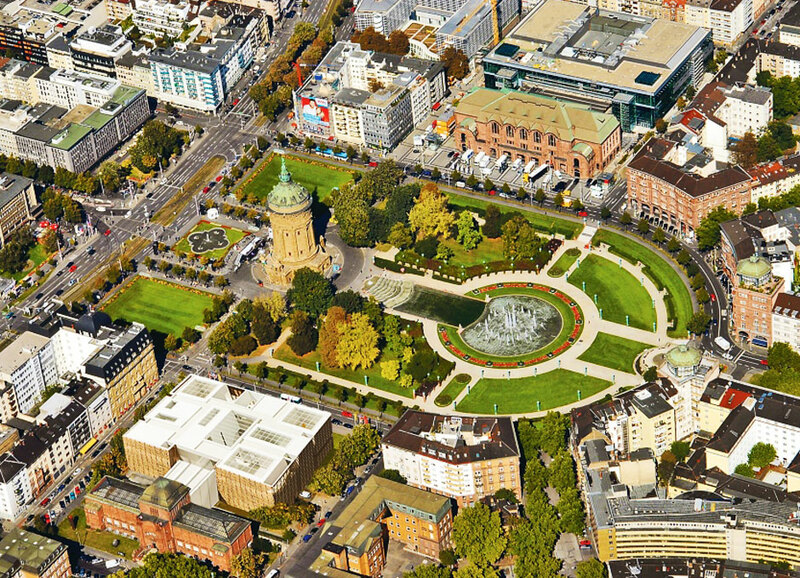 Das Ergebnis: eine Art Gesamtkunstwerk Mannheim. Man wird die Kosten kritisieren. Die Angaben schwanken zwischen 1,5 Millionen bis 2,2, Millionen Euro. Das Ereignis als solches bleibt singulär. Überwältigend. Ein perfektes Bewerbungsschreiben für Mannheim. Sehnsucht, die Name ist Europäische Kulturhauptstadt 2020.